We’re using more connected devices than ever before, and spending an ever-larger part of our day online. And while being connected has opened up a world of information, entertainment and convenience, it has also opened a Pandora’s Box of risks, from password theft to malware infections to phishing sites that steal your banking information. Protecting against these risks is much easier when you have malware protection that covers your family’s computers and mobile devices from a wide variety of attacks. Bitdefender recently launched its 2018 product line with a range of offerings that provide everything from robust malware protection to privacy tools to parental controls that let you control and monitor what your kids are doing online. Read on for an overview of all the features in the Bitdefender 2018 lineup and how they will help keep you and your family safer online. At its core, any antimalware suite must offer solid antimalware protection to defend against both known and new (“zero day”) threats. Bitdefender uses a combination of virus signature scanning and advanced heuristic methods to detect malicious behavior. While many other programs offer similar types of scanning, what’s critical is how well these features perform. 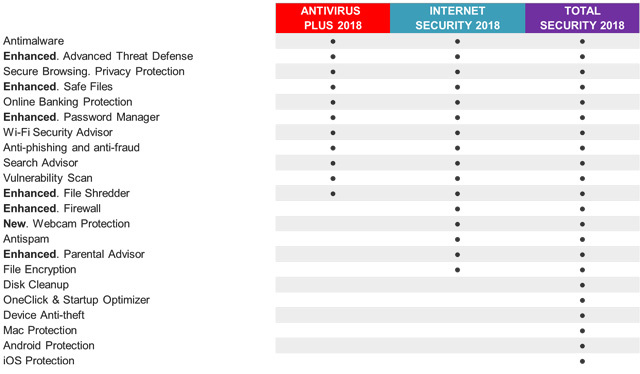 In recent testing of Windows 10 solutions, Bitdefender was rated as a top product by independent testing lab AV-Test for both its ability to defend against real threats, as well as its very low false positive rate. Because ransomware can have such a devastating impact – preventing you from accessing all the important files on your computer unless you pay a hefty ransom - Bitdefender Safe Files provides additional protections in case some new variant of ransomware manages to evade detection. 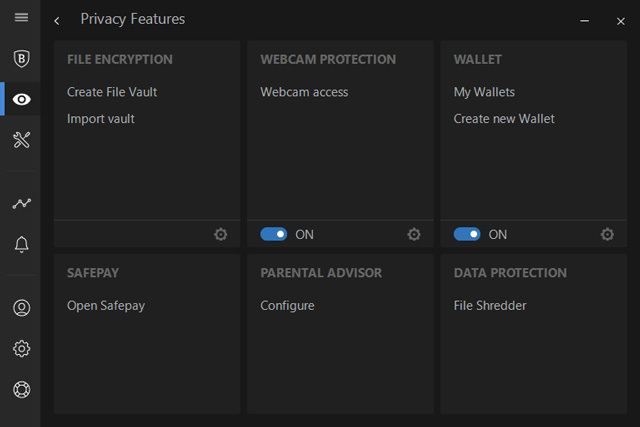 Safe Files automatically protects folders like Documents, Pictures and Desktop, where most people keep important files. You can add additional folders, and also protect folders from cloud sync services, such as Dropbox, OneDrive and Google Drive. When a potentially unsafe application attempts to change or delete a file in a protected folder, Safe Files automatically blocks it and you get alert. If you trust the application, you can choose to give it access. Many malware attacks take advantage of vulnerabilities in common programs or system software. 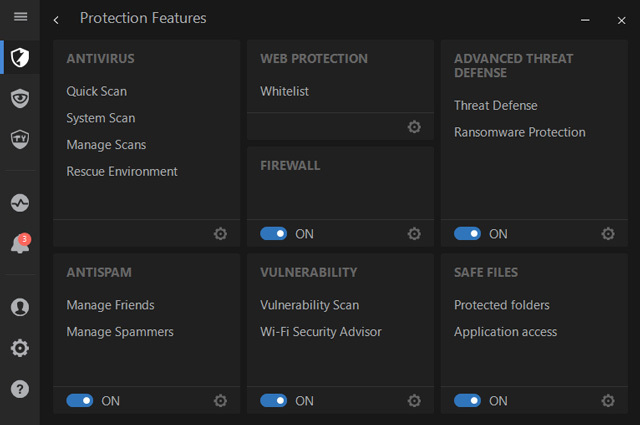 Bitdefender scans your system for vulnerabilities regularly, in the background, and alerts you to detected issues. The Vulnerability Scan will also tell you about potentially unsafe system settings and Wi-Fi network connections. As an added layer of protection, Bitdefender Firewall blocks potentially malicious applications that want to connect to the Internet to prevent your personal information from leaking out. There have been a number of news stories about victims of webcam spying. Perpetrators of these attacks trick you into installing software or use other means to take complete control of your webcam, enabling them to turn it on at will and spy on you without any indication that your camera is even on. Bitdefender Webcam Protection detects when an application connects to your Windows webcam and automatically blocks access to those are unknown or aren’t trusted. If you’re not using the webcam, you can set Bitdefender to block all access to the webcam. When you delete a file on your computer, it is not actually removed. The system will no longer point to it as a valid file and it will make that space on your hard drive available to be overwritten. But, until that data override happens, the file data is still there and can be easily recovered. While this may not be a big concern for your day-to-day use, if your computer is lost or stolen, or you plan to give it away or sell it, you don’t want the new owner to be able to recover your old files. Bitdefender File Shredder permanently deletes files by overwriting the data with new, random data so that it becomes completely unrecoverable. Simply drag & drop files and folders to the shredder window or use the shredder feature integrated into your Windows file explorer menu. Want to protect sensitive files on your computer from snooping eyes? Bitdefender’s File Vault creates an encrypted vault or logical drive, on your computer that no one can access without a password. The vault when you want to add or work on files, then lock it up when you’re done. There is nothing more important to protecting your privacy and financial security online than proper password management. And doing it correctly means creating complex passwords that cannot be easily guessed or hacked, and using unique passwords for every site. Of course, remembering dozens of complex passwords is an impossible task, which is why a password manager is so important. Bitdefender Password Manager provides secure storage (encrypted and password protected) for your login information, along with other sensitive information such as credit card details and other personal information. 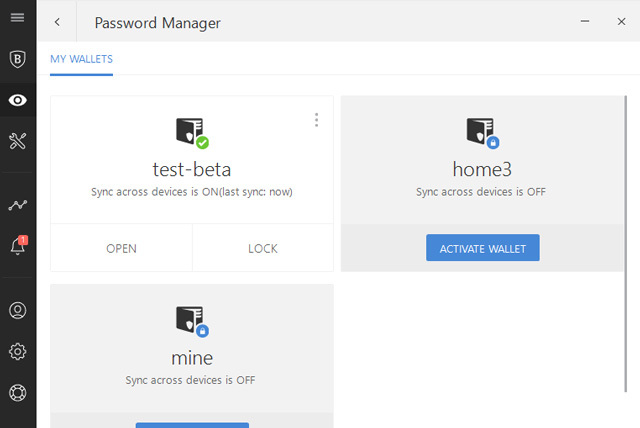 Password Manager will automatically gather your login and personal information when you sign up on websites or sign in, and then fill in your credentials when you visit the website in the future. It can also simplify sign ups and online payments by filling in the forms with personal information, credit card and billing details. Not sure how to create a secure password? The integrated Password Generator will do it for you. And your login information can be synced across all your Windows PCs. When you send information over an insecure Wi-Fi network, snoops can intercept your data. Bitdefender’s Wi-Fi Security Advisor analyzes Wi-Fi network security levels and informs you whether they’re secure or not. 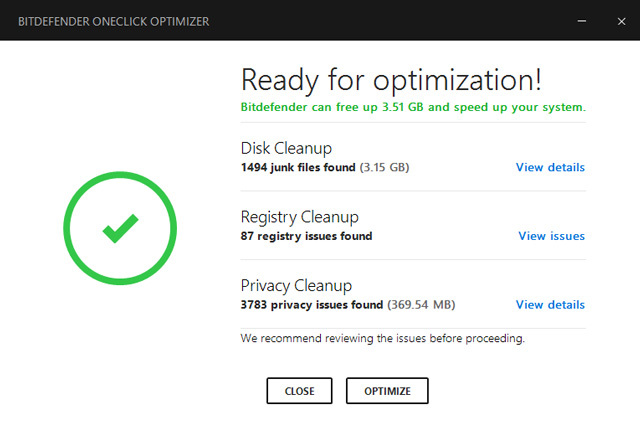 Beyond keeping you more secure, Bitdefender’s OneClick Optimizer also keeps your PC running better. OneClick Optimizer makes it easy to free up space on your hard drive, fix registry errors and clean up potentially exploitable privacy data from the system, such as browsing history, browser download history, cookies, temporary internet files, recent documents list and recycle bin files. Startup Optimizer minimizes the boot time by managing programs that launch at startup. It displays all the applications that start when the computer boots and lets users disable or delay their startup. If you need help deciding which to disable, consult the Community choice chart which shows with percentages showing what other Bitdefender users chose to do for each action (Enable, Disable or Delay). If your Windows PC or mobile device is lost or stolen, Bitdefender Anti-theft helps you secure sensitive information by allowing you to remotely locate or lock your device and even wipe all data. Anti-theft also allows you to retrieve the last known IP address of your device and snap photos with your Android or Window PC (performed with front camera). It can be managed exclusively through your Bitdefender Central account from any device connected to the Internet. Keeping your kids safe online is about much more than virus protection – it’s also about managing the content they see and the time they spend on their devices. Bitdefender Parental Advisor enables you to control access to inappropriate web pages on the Internet and specific applications on your child’s device. Also, Parental Advisor can locate your child’s position and monitor all SMSs and calls sent or received. If you have specific concerns about what your child is doing on Facebook, you can configure Parental Advisor to monitor your child’s Facebook account, including uploaded photos, account privacy settings, places, likes, groups, and events. All of the posts and comments from your child's wall and Newsfeed are sent to Parental Advisor for you to review. 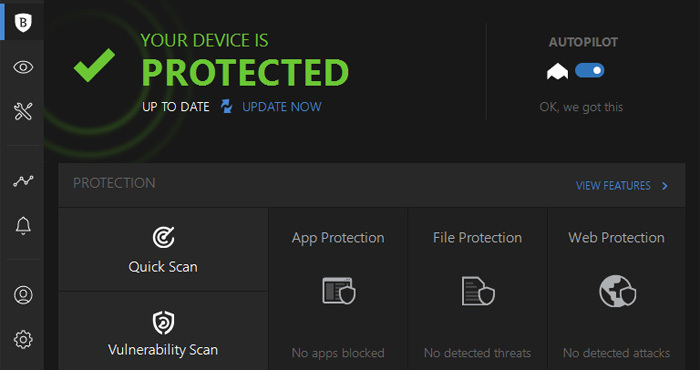 The Bitdefender 2018 product suite is available on Bitdefender.com. For only $49.99 (regularly $89.99), you can get Bitdefender Total Security with coverage of up to five devices (Windows, Mac, Android and iOS) for one year, or cover up to 10 devices for only $5 more. Bitdefender also offers a 30-day free trial so you can give it a try before you buy.